I interviewed Mr. Love, our neighbor in the 3100 block of West Pikes Peak Avenue, in the fall of 1928 when I was turning sixteen years old and he was eighty-four, my present age. My brother, Ira, lent me a camera to take Mr. Love's picture. I submitted this article and the photograph to the Gazette-Telegraph, which ran both of them without any byline or credit of any kind. This was my first publication in American history. In my youth, the sixty years from 1928 back to 1868 when Mr. Love first arrived in Colorado City, seemed to me like an unimaginable length of time. Since my conversation with him, more than sixty years have passed. That now seems like a very short time. In the shadow of Pikes Peak, where three score years ago Arthur Bascom Love lived in the color and uneasiness of frontier life, now with his wife he lives in quiet and security. Whereas his house once stood out alone, others have since sprung up all around, and innovation and change have made "old town" almost unrecognizable. "Bee" Love, as he was known to his old friends, lives in the past. A few words, a question, and the years are magically erased. While he strokes his grey beard, a faraway look comes to his faded blue eyes as if he were actually peering across the brink, trying to locate some object, some event, afar on the opposite bank of the chasm of time. Born in Kentucky of pious Methodist parents who named four boys of their family of ten boys and two girls for Methodist bishops, he spent a large part of his youth across the line in Missouri. "Why did I come west?" He chuckled. "Oh, just to better my fortune - like every one else." And by what whims of fate he was denied a fortune! Accompanied by a friend, Arthur Love, a young man of twenty-four years, set out on foot from southeastern Missouri in April, 1868. At Sedalia he parted with his companion, who turned back to Illinois. Shortly afterwards, Love became ill with typhoid fever. In a few weeks he was wandering the streets, penniless, friendless and weak from his recent illness. He secured work, at last, with the Union Pacific Railroad, which was building westward. When he quit, he was given a ticket on which he could "ride as far as he wanted to." He left the train at Cheyenne, Wyoming, virtually the western terminal of the road at that time. Since two of his brothers were already in the Pikes Peak region, he started in that direction. He rode with mule team freighters to Denver, then walked the eighty miles through Indian-infested territory to Colorado City. Of his trip he observes in that way of his, "I started out walking and I ended up walking, but I didn't walk all the way." Not long after his arrival, he sold his 160 acres on the east bank of Monument Creek, the present location of the Colorado College campus and the fine residential section of Colorado Springs, to the Fountain Colony Company for thirty-five dollars! That was the first time a potential fortune slipped through his grasp. Mr. Love bought his brother's holdings and during the late 1860's and early 1870's drove cattle in summer and freighted to Denver in winter. In either case, the dangers were plenty since the Cheyennes and Arapahoes were making their last stand to hold their tribal lands and were using intimidation as a means to drive out the settlers. Once, when Love and two other companions were each driving a seven team wagon through the Black Forest, they saw a band of hostile Cheyennes riding along at a distance, shadowing them. Only the fact that the wagons were covered, keeping the Indians in the dark as to the exact number of white men, prevented an attack. When Mr. Love tells of these experiences, red depredations, calls to the log fort, and all, he never uses the word "scalp" or "massacre": the words are "skelp" and "massacray." Needing posts with which to fence his ranch, he took a claim in Williams Canyon. 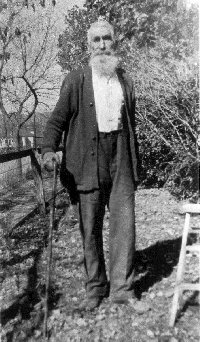 In compliance with the homestead law, he built a cabin and put in the winter of 1869 there. Before spring had come, crippled from rheumatism, he was forced to walk on crutches. His shack was but a short distance from the "sody springs" at Manitou, enabling him to bathe his afflicted leg every morning in the natural carbonate basins of bubbling mineral water now piped to the immense bathhouse, where people from the country over came to ameliorate their various ills. It was while hobbling about on crutches that he first noticed in the side of the canyon the mouth of the cave which was later to become famous as the "Cave of the Winds." This he determined to explore when opportunity offered. As soon as he was able, he shoveled out the opening, making the access easier, and entered. There, in the flaring light of a pine-knot torch, human eye first beheld the wonderful, grotesquely gorgeous formations of that vast cavern. Little did 'Bee' Love dream, as he gazed on the beauties of the subterranean palace and made his way in awe from chamber to chamber, that the time would come when the cave, lighted by electricity, would be visited by more than a thousand people a day. A veritable gold mine. "Better than a mine," as Mr. Love himself says, "because it never plays out." Then, unaware of its value, he let it go. It changed hands several times before it was finally exploited. This second potential fortune also slipped through his grasp. Had he kept it, his declining years would have been easier. After he was married in 1874, Love and his wife moved to South Park, a prairie in the mountains, and ranched there for a year. From that time Love's privation and pleasure, hardship and happiness, were shared by his wife. Three children, two girls and a boy, were born to them. Following a brief visit to Kentucky, Love returned to Colorado City and prospected a while in the neighboring hills with indifferent success. He turned again to his old occupation of ranching until about twenty years ago, when he took up work in the city. "I never had any money I did not have to work for," are his words, and they are tinged with something akin to pride. On Sunday, until recently, his ancient buggy might be seen regularly hitched outside the Methodist church. But his horse is gone; his cow is gone, too. Just the chickens and dog, beside the orchard and garden, remain to be taken care of. His bulky, clock-like watch, fifty years old, says five minutes till five. "I've got a little irrigating to do - going to let it soak in for the winter," he explains as he walks off with the support of his cane. And as I look after him, I reflect on this man who makes up none of the chronicled gilt edge, but is a unit in the solid foundation of this western empire.